Bat-Week flies on, and so does the Christopher Nolan Batman Universe. I'm Linus Schill, and this is my review of The Dark Knight. There are a lot of things that make this movie so great, and so entertaining to watch. First of all, you are coming from and already established character and universe, so there is no backstory that wastes time. Second, the movie jumps right into the action. The first shot of the movie is of the Joker's goons repelling to the bank they are about to rob. Also it takes the world from the previous movie and builds on it, expanding it. Moving from CG shots to real helicopter shots over a city. Also, having it shot secondarily in IMAX helps add to the larger scale the film tried (and succeeded) to achieve. While at times it felt a little awkward jumping back and forth from full screen to letterbox to fullscreen in just the same scene, it worked overall. The Joker was another thing that made this movie so good. Everyone knows that Heath Ledger's Joker was great, and everyone raves over it, but thats not all. The fact that he was not silly, and that he had a tragic backstory that was worked in subtly made him all the more realistic. Toxic waste didn't give him a permanent smile, no his father with a butchers knife did. You could say that he doesn't have a motive in this movie, but that's the point, and thats explained. He doesn't have a motive. He wants to watch the world burn, thats all. He doesn't want money, he doesn't want revenge, he just wants to prove a point. Because of this, it makes him all the more scarier. Two face was also a really good character. Following a long with the Joker's theme, he wasn't dropped half in toxic waste, no, he was kidnapped, and a fire exploded on his face and burnt half of it off. The rage and despair drove him to be a villain. This was a really great film, and it gets 4.5 ingredients. Despite being great, nothing is perfect. Thank you for reading my review of The Dark Knight. 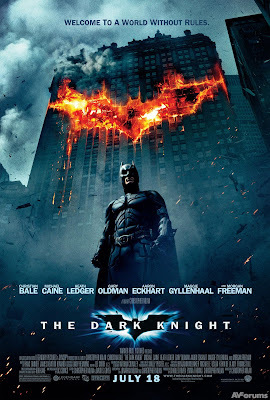 Bat-Week concludes tomorrow with The Dark Knight Rises. Feel free to check out the other reviews from Bat-Week in the yellow drop-down menu at the bottom of this review. See you next time!